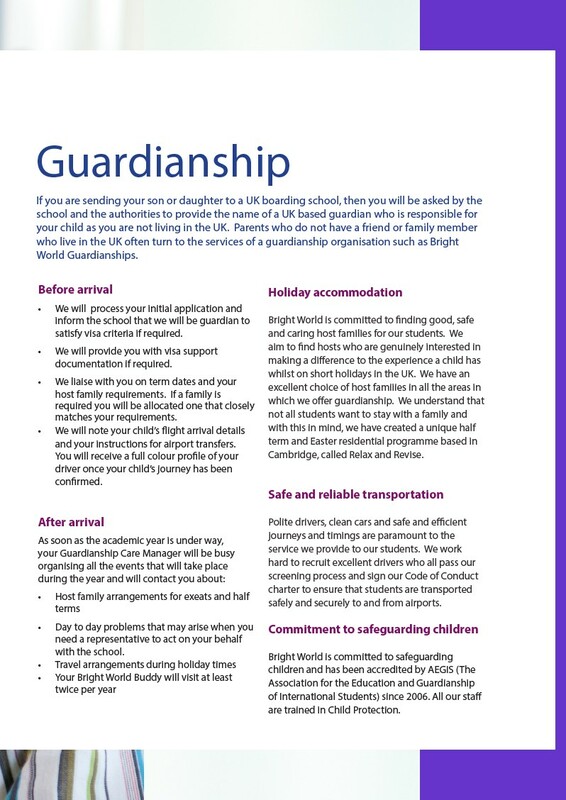 Guardianship If you are sending your son or daughter to a UK boarding school, then you will be asked by the school and the authorities to provide the name of a UK based guardian who is responsible for your child as you are not living in the UK. Parents who do not have a friend or family member who live in the UK often turn to the services of a guardianship organisation such as Bright World Guardianships. arrival Before •	We will process your initial application and inform the school that we will be guardian to satisfy visa criteria if required. •	We will provide you with visa support documentation if required. •	We liaise with you on term dates and your host family requirements. If a family is required you will be allocated one that closely matches your requirements. •	We will note your child’s flight arrival details and your instructions for airport transfers. You will receive a full colour profile of your driver once your child’s journey has been confirmed. After arrival As soon as the academic year is under way, your Guardianship Care Manager will be busy organising all the events that will take place during the year and will contact you about: •	Host family arrangements for exeats and half terms •	Day to day problems that may arise when you need a representative to act on your behalf with the school. •	Travel arrangements during holiday times •	Your Bright World Buddy will visit at least twice per year Holiday accommodation Bright World is committed to finding good, safe and caring host families for our students. We aim to find hosts who are genuinely interested in making a difference to the experience a child has whilst on short holidays in the UK. We have an excellent choice of host famiiies in all the areas in which we offer guardianship. We understand that not all students want to stay with a family and with this in mind, we have created a unique half term and Easter residential programme based in Cambridge, called Relax and Revise. Safe and reliable transportation Polite drivers, clean cars and safe and efficient journeys and timings are paramount to the service we provide to our students. We work hard to recruit excellent drivers who all pass our screening process and sign our Code of Conduct charter to ensure that students are transported safely and securely to and from airports. Commitment to safeguarding children Bright World is committed to safeguarding children and has been accredited by AEGIS (The Association for the Education and Guardianship of International Students) since 2006. All our staff are trained in Child Protection.